In a recent post, we discussed ANSI/ASHRAE/IES STANDARD 90.1-2016 – Energy Standard for Buildings Except Low-Rise Residential Buildings (I-P Edition), the standard carefully written to detail the many energy efficient design considerations for buildings. 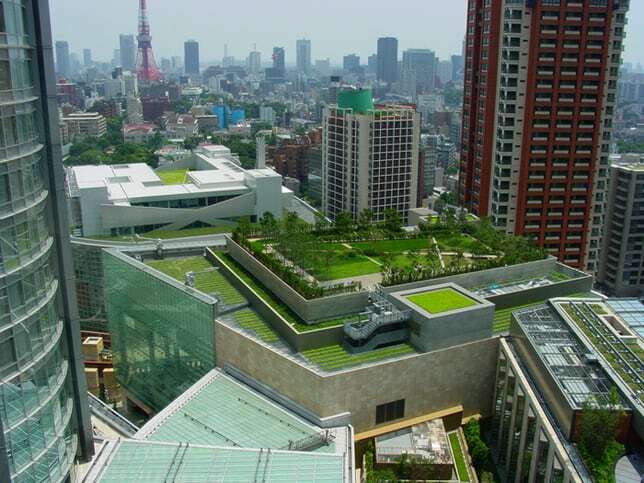 The standard defines a vegetative roof system as “vegetation, growth media, drainage system, and waterproofing over a roof deck.” In other words, this is a green roof, and the planted gardens and vegetation elevate the energy efficiency of a building by reducing the energy needed for its operations. To describe this process in the simplest sense, sunlight acts as a natural source of heat for a building, as the materials comprising its roof and sides absorb the daily dose of thermal energy. Generally, roofing is composed of asphalt and other dark materials, which facilitates high take-in of the natural astral heat. However, with an installed green roof, the plant life on the exterior of the building absorbs the sunlight through photosynthesis, greatly reducing the internal rise in heat. In fact, it has been found that an extensive green roof can reduce daily energy demand for air conditioning by 75 percent. 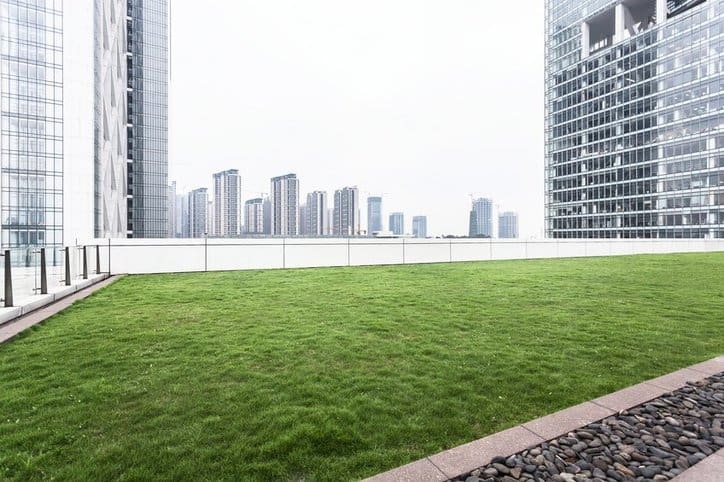 Furthermore, the energy efficient advantages of a green roof extend beyond a reduction in efforts made to cool buildings, since the vegetative roof systems are responsible for moderating the building’s overall temperature. Due to the combination of vegetation, growth media, and a drainage system, a green roof sufficiently insulates buildings, which reduces the need for heat during the winter and cold months. The improved indoor air quality containing green roofs is another advantage for the building’s efficiency. The plants on green roofs capture airborne pollutants and atmospheric deposition, and they filter noxious gases. This reduces usage and cost of HVAC systems, which can struggle to ventilate the particulate matter. In addition, the reduction in energy usage also eases the demand placed on power plants, which can limit emissions of carbon dioxide and other polluting by-products. Aside from significant enhancements in a building’s energy usage, a green roof draws improvements in stormwater management and property value, and it is responsible for a reduction in noise, electromagnetic radiation, and the urban heat island effect (the process by which a lack of vegetation heats cities). It can even help treat depression. In addition, green roofs are notably more fire retardant, since they have a much lower burning heat load than do conventional roofs. However, securing this embellishment, just as with the many other advantages of green roofs, requires appropriate design and installation methods. For ingraining the necessary fire protection into the vegetative roof system, the ANSI/SPRI VF-1 – External Fire Design Standard for Vegetative Roofs standard, which was developed through cooperation with Green Roofs for Healthy Cities, is highly recommended. This document was written and developed by the Single Ply Roofing Industry (SPRI), and it was approved by ANSI. The other major SPRI green roof standard to have undergone this process is ANSI/SPRI RP-14 – Wind Design Standard for Vegetative Roofing Systems, which calls for installation procedures that grant longevity for a vegetative roof system. 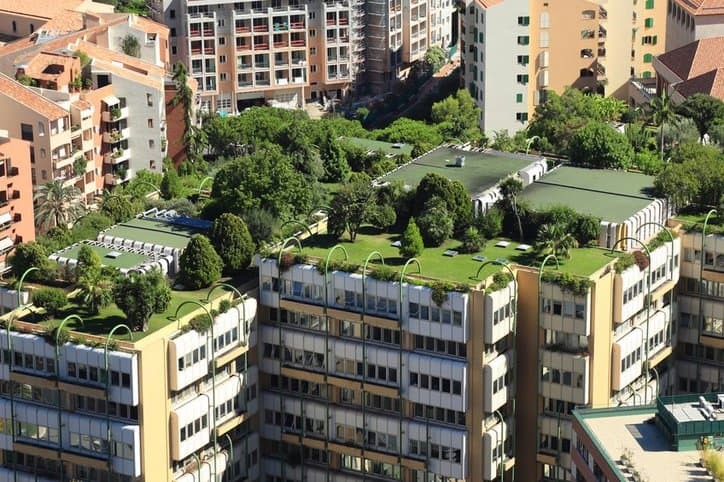 You can learn more about additional standards for the design, installation, and maintenance of these roofs and their different components in our past post on green roofs. Yes we do! You can find ANSI on Twitter @ansidotorg. You can also check out the links to our Facebook, Instagram, and Google Plus pages at the top right hand corner of any blog page.